Description Identify contiguous regions of a volume matching a specified amplitude threshold. The Body Detection process identifies contiguous regions of a volume that match a specified amplitude threshold. A volume and a probe are required for this process. In addition to the body display, the process creates a virtual volume of the detection result. Included samples are assigned a value of 1, and excluded values are assigned a value of 0. The body detection virtual volume can be exported or used for additional operations, such as picking the top and base as horizons. In the Details Panel, select the volume which you want to use in the body detection process at Volume. You can also select a gather volume for this process. Select a probe at Probe to restrict the body detection process within the selected probe area. At Amp Cut-off, select Above or Below and type the amplitude value to detect and display only voxels in the volume that are above or below this value. At Neighbour Rule, select the neighbour rule you want to apply in the process. The rule determines the level of tolerance in the formation process of the geobody based on the space of the voxels. Available options include Face, Edge and Vertex. Face — Two voxels must share a face to be included as part of the body. Edge — Voxels must share a face or an edge (i.e. two corners) to be included as part of the body. Vertex — Even if voxels are diagonally connected and share only a single vertex, they are still included as part of the body. Type the minimum volume to apply the neighbour rule at Min body volume. The neighbour rule and the corresponding minimum volume are used to determine whether groups of voxels based on the minimum number of faces/edges/vertices are combined to form a body. Note: If you have input a volume with TWT extents, the units will be displayed as m2s. To obtain a volume in m3, make sure you use a volume with TVDSS extents. You can convert a volume to depth by changing the vertical extents during Export Volume and selecting Add to session when export completes. At Colour, click the colour bar to select a colour of your choice for the body. You can also adjust the opacity level of the colour. 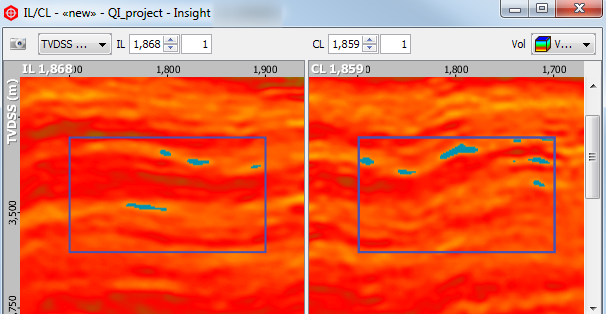 The following example displays body detection on a VpVs asymmetric volume at an amplitude cut-off value of below 1.7. The generated total volume of the body is displayed at Total volume in the Details Panel of the body detection process. The body detection process creates a body detection volume. It can be used to pick horizons along the geobody. 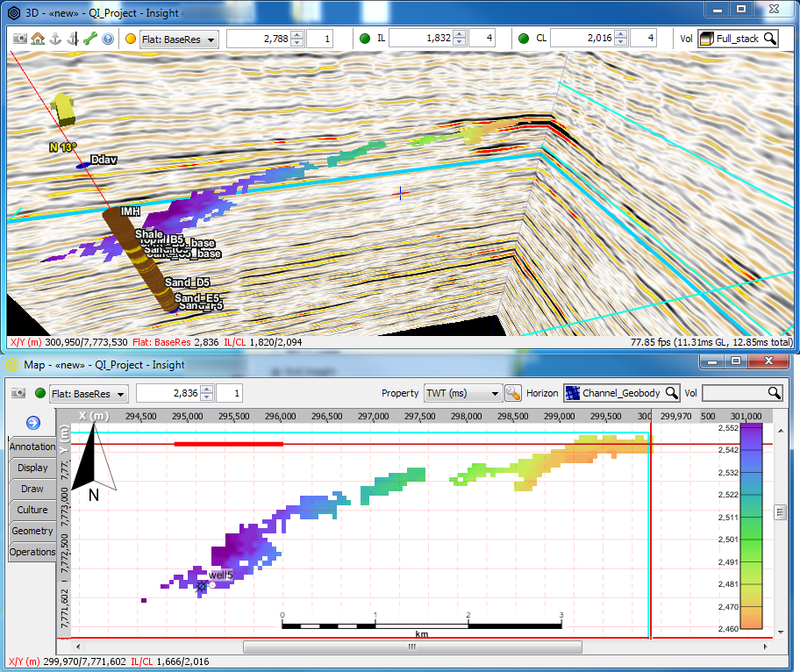 Display the geobody in the 3D View. In the example above, the geobody is displayed in the flattened domain. A clear channel can be seen. To propagate a horizon. Open the Horizon tab and create a new horizon (see Horizon Propagation for more details). Enter the Propagator picking mode. 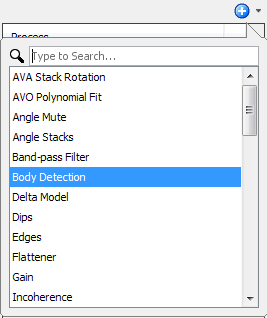 Select the body detection volume in the Volume for horizon seed points section. Set event type to Zero Increasing. 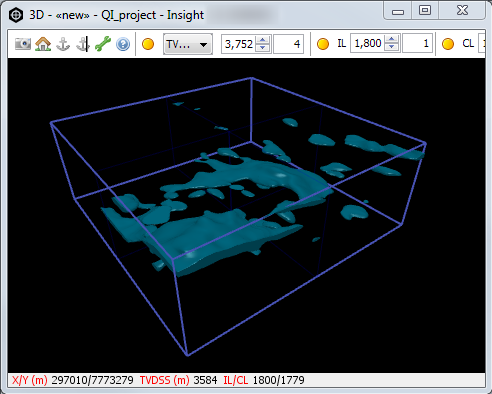 Pick seed points in the IL/CL View, or 3D view directly on the body detection volume. 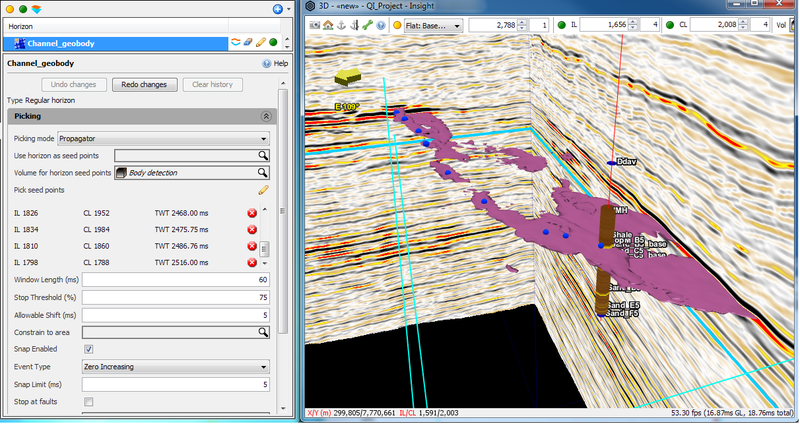 When picking in the 3D View, scroll IL/Cl to intersect the geobody and place pick. Note: Insight will place picks on the body detection volume if it has been selected as Volume for horizon seed points. You can have a stack data volume displayed for reference. Continue placing seed points or use the existing horizon as seed points in propagator. Right click the Body Detection volume in the Volume tab. Choose an output directory and check the export parameters. Select the Add volume to session when export completes option to import directly into session after exporting. Geobodies can be exported in SEG-Y or Insight's DUGIO format (see Export to SEG-Y and Export to DUGIO for more details).